Have the small weight clases finally caught on? Discussion in 'UFC Discussion' started by grooves12, Aug 2, 2015. I remember in the early days of additional smaller weight classes, there was little to no interest in most of them. These days, it seems like the biggest stars are coming from those divisions. McGregor just put on one of the biggest shows with a last-minute replacement. Dillashaw has made himself a star after dismantling Barao in two compelling fights. Rousey is the face of the UFC. 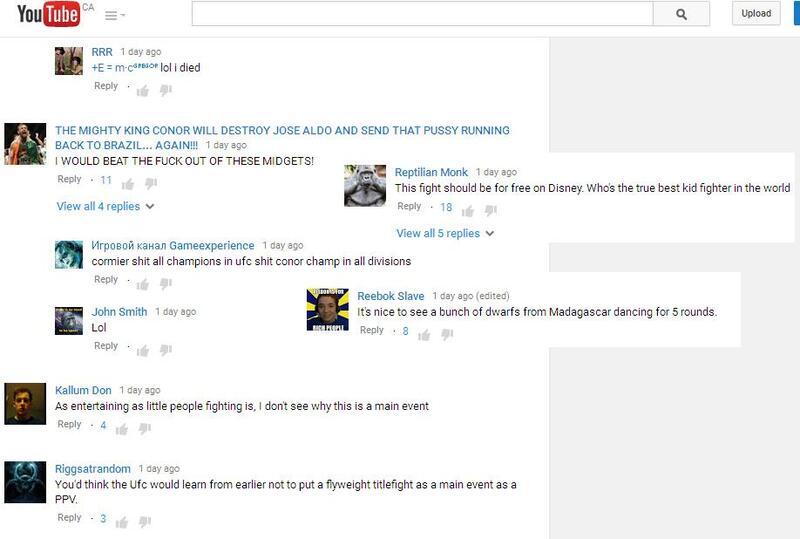 Even the Mighty Mouse vs. Dodson fight has some hype behind it. Have you changed your mind on the smaller fighters? UFC 189 was card of the year and didn't have a single fight above 170lb and nobody cared, I'd say the lighter weight divisions are too talented to not catch on eventually. Who does Dillashaw fight next? There's Cruz and that's about it. Maybe Assuncao but no one gives a flying f*ck about him. FLW is still a joke of a division, as is WBW and WSW. People like one or two fighters in each division and that's about it. So no, they haven't caught on because people will never respect little guys when they think they can beat them even though they don't train or lift weights. It seems so. If not, Sherdog has just quit bitching about it which is also good. Ronda Rousey hasn't caught on? Conor Mcgregor hasn't caught on? Joanna is also drawing some attention. I'm usually fine with anything other than Flyweight. On Sherdog I don't think so, but seeing as the UFC's biggest stars are Conor and Ronda. I think the lighter weight classes are doing great. People like one or two fighters in each division and that's about it. Do you really think they'll watch other WBW, WSW, or even FW fights not featuring those guys? Everyone says that about EVERY division... there are only about 2 worthy contenders at any given time. Howver, by the time those fights play out, there is always somebody else that has stepped up. But, they are WATCHING, and that is all that matters. People can hate on Conor and Ronda all they want, if they put asses in seats regularly, they have caught on. Anyone that watched the WEC knew this was inevitable. They put on some great cards with the lighter weight classes. It doesn't mean they are better than the heavier weight classes, just that they are legitimate as well. MMA fans should enjoy good fights no matter how much the competitors weigh. There seems to be a lot of hate on here for the so called "manlets" and I'm not sure why. They are only watching those 2 stars, not the division. They will still not care about the majority of FW fights. So if by "catching on" you mean the 2 or 3 FW fights that Conor Mc is in a year gets views, then sure it's caught on. Technique has evolved to a point where the lighter weight fighters can also knock each other out regularly, so now i guess they're like heavyweights but more active and entertaining to watch. I prefer them honestly. Seems to be less fights were they guys gas out. It has in a way but Dodson Mighty Mouse has no hype. I'm hyped for it because I'd love Dodson as champ but yeah nobody cares about that fight. Featherweight has caught on, BW isnt quite there yet, and FlyW has a long ways to go. None of that is true. The fight world in the last year as revolved around Conor, Ronda, Mayweather, and Pac. All little guys and a woman. Casuals never care about "divisions" just stars. It just takes time to build familiarity with the fanbase. The primary reason Sherdog gushes over heavyweights is because the same fighters have been at the top for over a decade. Yeah, people are realising that HW/LHW are ridiculously shallow and that the talent pools from WW on down to BW are significantly larger and more intense.